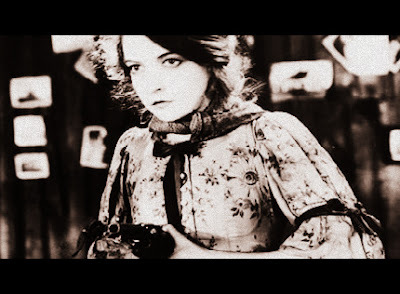 I was thoroughly charmed by the movie, Hugo. In celebration of my birthday last December, and the last exam of the semester having passed, I hunkered down in my theater seat, a bucket of popcorn the size of my head resting in my lap, and my uber cool 3D glasses wrapped around my own.....I was the epitome of a nerd, but without a care in the world; it was a matinee at a small-town movie theater and I owned the entire place. No one, NO ONE, else was there. So I wedged my heels between the two seats in front of me, propped my sneakered-feet upon the armrests, and settled in to be delighted. And I was not to be disappointed. Now I want to live in a Parisian train station! Much like our own major airports, the train stations, like Gare de Lyon are massive hubs, bustling with activity, offering all types of foods and shops Located within Gare de Lyon, Le Train Bleu, below, serves small plates, a light bite, or a leisurely prix fixe repast to hungry travelers, or those who come just for the food, with no departure to rush towards. 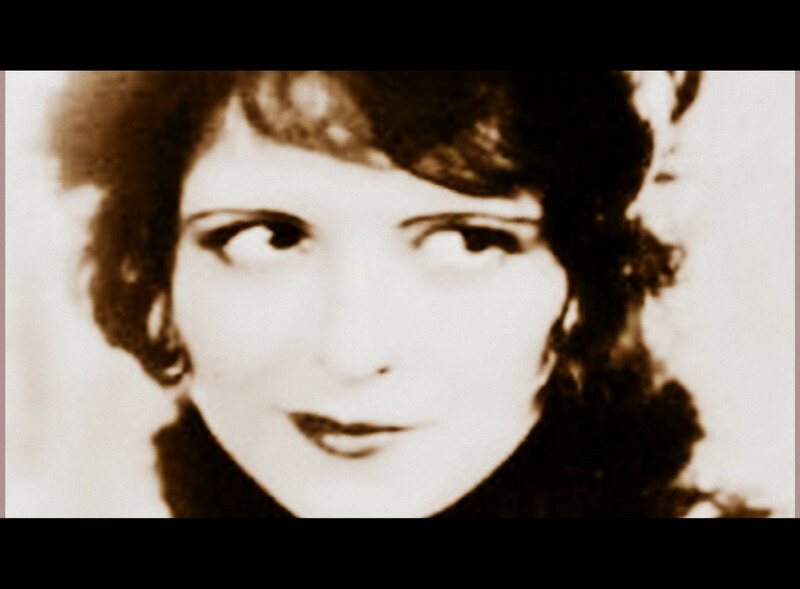 Please visit their website, elect to play the music, visit the photo gallery, and let your imagination take you to Paris for a brief, but lovely moment, today. I was surprised to find what I was looking for, the cheese plate(! ), was one of the least expensive plates on the menu, at 16 euros. 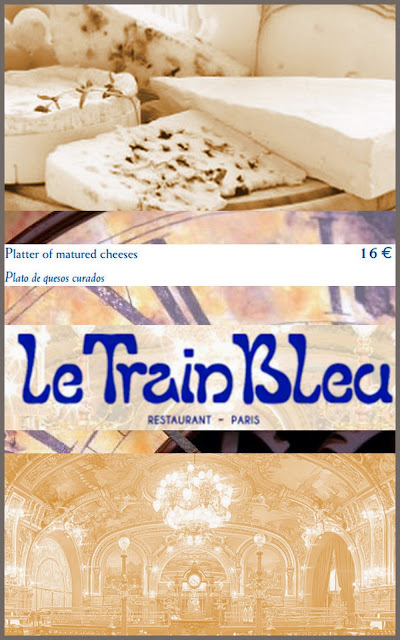 And, though we may only have Paris in our imaginations today, we can have that cheese plate ANY day. 1. The odds: As in decorating, the cheese plate is a great place to employ the odd number rule. Offer 3 or 5 types, or even consider one large serving of a favorite, notable cheese. 2. 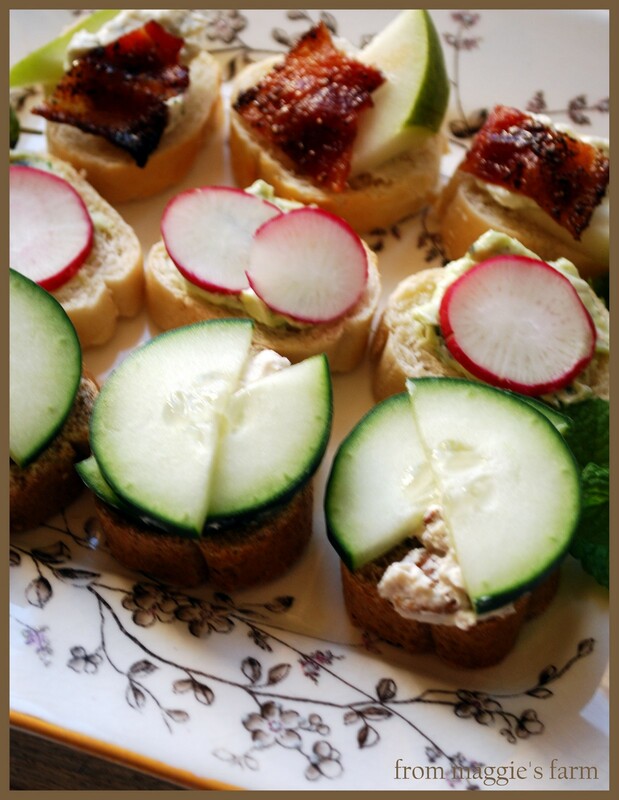 You got served: If just one of several elements of an appetizer 'buffet', serve 1-2 ounces per cheese per person. For example, if there are 16 people to be served, build a cheese plate with one pound (16 ounces) of each cheese, whether 1 cheese, 3 cheeses, 5 cheeses, or more. If served as a dessert plate, or as the sole appetizer, begin with 4-6 ounces per person, per cheese. 3. Stick with a theme: This is less a guideline as it is a help for the host or hostess in choosing among thousands of options. Country of origin, milk types, aging processes, producer, texture, wine pairing, are all good places to start. 4. Arrange cheeses from mildest to strongest, with large sections of rinds pointed in (so cheese can be accessed for serving). 5. Consider accompaniments carefully. I prefer breads to crackers, and love a fruit and nut bread for some cheeses. Crackers are perfectly acceptable, of course, but be certain to choose a cracker that doesn't interfere with flavor, while having enough body to stand up to the cheese. 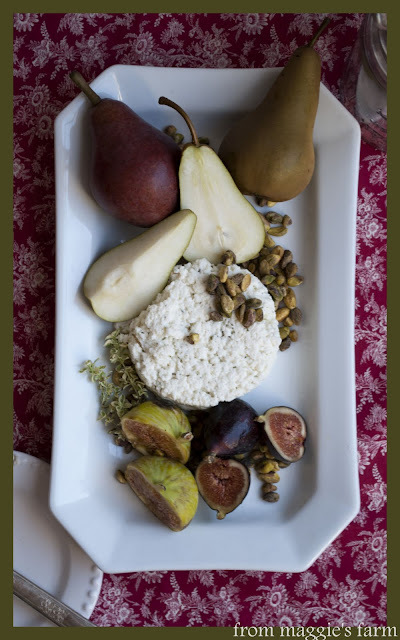 Fruits, nuts, olives, chutney's, mostardo's, quince paste or fruit 'cheeses' are all popular and interesting additions, served on the plate, or on the side. 5. Serve cheese at room temperature, removing from refrigeration at least one hour prior to serving, and allow each cheese it's own serving knife or utensil. 6. Find a reliable cheesemonger. This last step is one of the most important, as a helpful cheesemonger will help you with all of the steps above. They should be well informed, and you will find them passionate about cheeses, knowledgeable about the best pairings of food and drink, and will educate you in the best ways to serve, and store, each variety. 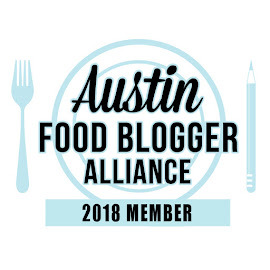 A gourmet grocery store is a good place to start, but if you're as lucky as we are in the Austin area, you'll have a favorite and friendly neighborhood cheese shop. The folks from Antonelli's Cheese Shop can't be beat for selection, knowledge, and service. Whether you're a local, or simply a cheese lover, visit their website for a 'taste' of what they have to offer, and as a valuable cheese-knowledge resource. 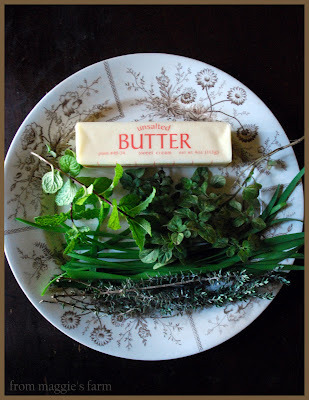 Notes From Maggie's Farm: You Are A Cheesemaker! The morning after. There were some regrettable decisions made, perhaps, but many memorable moments, punctuated the night. I mean The Oscars, of course. And though there were several good movies to watch this year, one of my favorites was The Help. Primarily, it was the love/hate nature of the film that kept me drawn into the story. Small triumphs frequently won over mean-spirited moments. And the period details--I loved them! The aqua blue kitchens, pink bathrooms, convertible Cadillacs, slick, tall, bouffants, cinched waist cotton dresses, and more than a few doilies. I loved the babushka-tied headscarves, the southern accents, even the crisp gray housekeeper uniforms, though they represented some questionable trends of the time. I wanted to hunt down and beat some of those characters, and some scenes were quite difficult to watch. 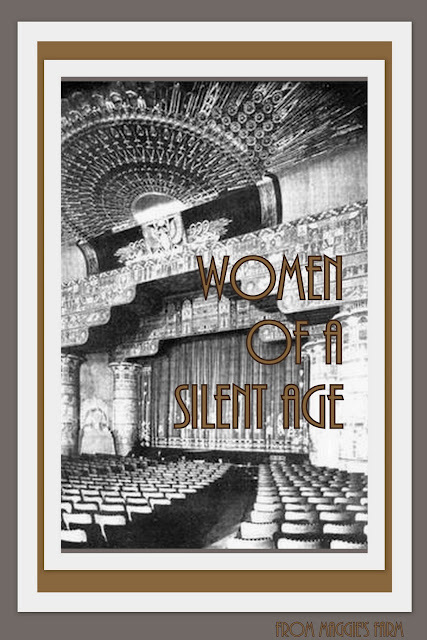 They were always interspersed with lighter scenes--and quite a few were filled with foods of the time. Who will forget the fried chicken, the deviled eggs.....the chocolate pie! 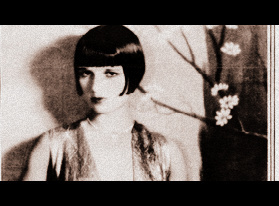 The ladies' luncheons were perfect excuses to serve the iconic foods of the time. So it was with a fondness for the movie we both so enjoyed that my friend, Karen, and I, hunkered down to watch the Oscars with snacks inspired by The Help--cocktails and tea sandwiches, three ways. Blend all ingredients together well, and spread on whole wheat baguette rounds. Top with thin slices of cucumber. Assorted fresh herbs--we used garlic chives, thyme, oregano, and mint. Mince stemmed herbs. Add to processor bowl with butter, at room temperature, and whipped cream cheese. Process until smooth. 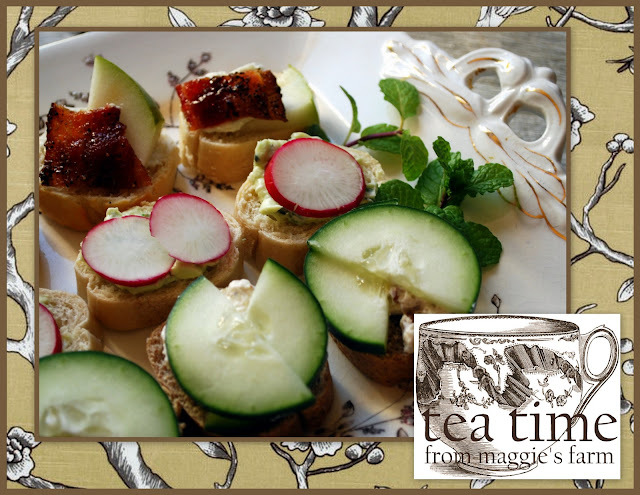 Spread on baguette rounds and top with thinly sliced radishes. Stir all ingredients together until well-blended. Spread on baguette rounds. Top with sliced pear, and pepper candied bacon (below). 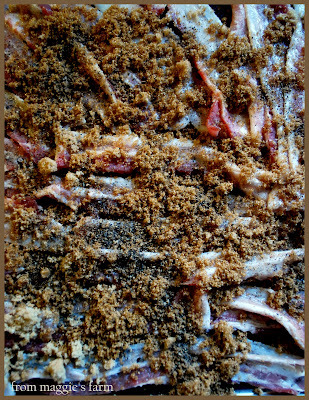 Lay slices of bacon on a rimmed, lined (silicone baking sheet, foil, or parchment) baking sheet. Sprinkle brown sugar, and smoked black pepper atop. Bake at 400 degrees until browned and chewy/crisp. Allow to cool, then tear, or cut, into 1 inch pieces. Who were your best dressed winners? 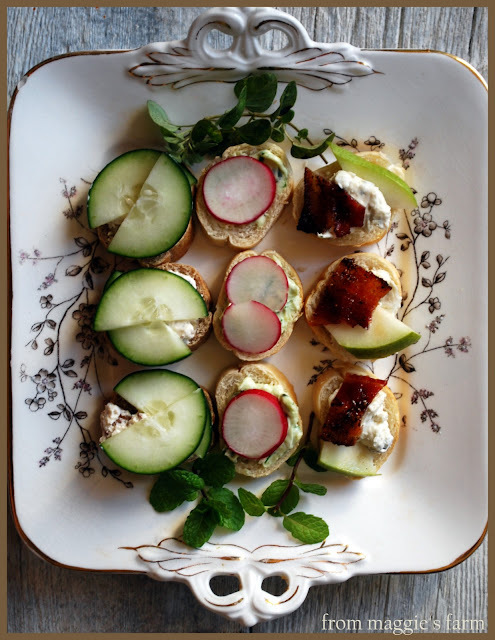 And more importantly, what were your favorite Oscar party snacks? 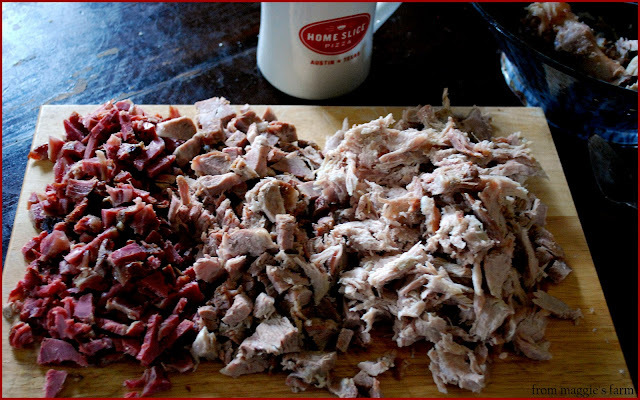 We share a combination of cultural and religious traditions around here, and that means that on Fridays during the Lenten season we abstain from red meat, pork, and poultry. We eat fish. Catfish, redfish, tuna fish...you name it. This Friday, we're revisiting Mardi Gras with the best leftovers, EVER--Seafood Gumbo, 'cause everyone knows that Gumbo's better the next day(s). 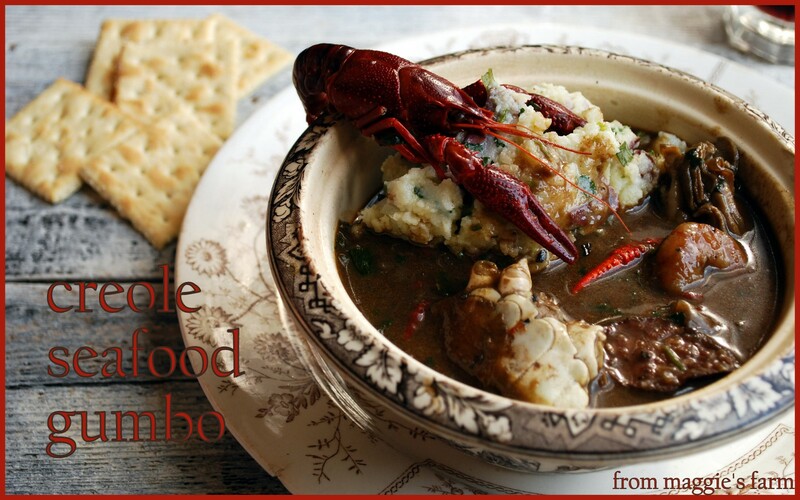 Every well-seasoned cook of South Louisiana, it seems, has their own perfect recipe for gumbo. Some add okra, others swear it off. Some add tomatoes, some scoff. Some serve it over rice, some over potato salad (Yes. You read that right. Potato Salad!). Some demand a dark roux, some a tad lighter, and thinner. Some with garlic bread, some with crackers. And there are as many eater requirements as there are recipes. 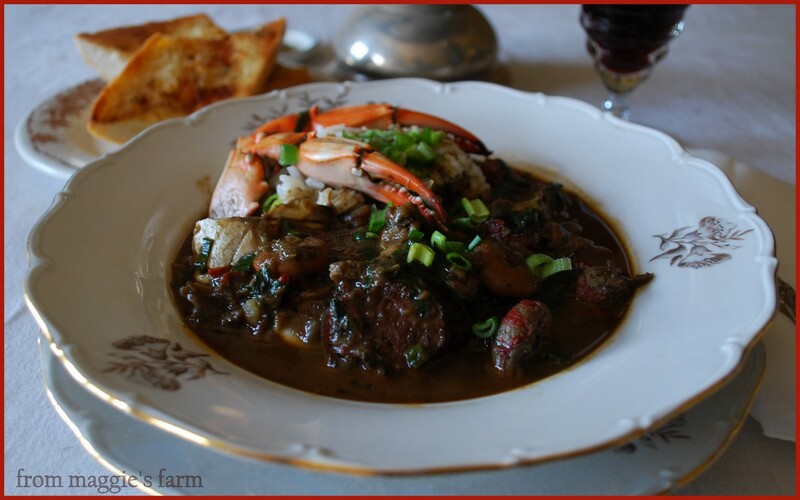 Below, is just ONE version of Seafood Gumbo, and, in fact, it's one of several versions we prepare, and enjoy. I have a few personal preferences: dark roux, no okra, no tomatoes, file powder (only on individual bowls), rice-but just a little, lots of dark stock, and it's just not right if it doesn't have oysters. But, I repeat, these are just MY preferences. Feel free to add, delete, substitute to make this your own. You'll be on your way to a simmering pot of magic. I find the secret to successful preparation of gumbo is the in the mise en place. Chop, press, crush, peel, shuck, and mince all ingredients prior to beginning anything. Collect seasonings, stocks, and other ingredients, and pre-measure. Have cooking utensils you'll need at the ready. Be completely prepared before you even step foot up to the stove. And, by all means, don't try to do anything while you're stirring that roux! Well, okay, you can sing, dance, count your blessings or pray. But that's about it. 4-6 blue gumbo crabs, shelled, cleaned of gills, legs and claws removed (reserve legs for stock, and claws for da gumbo), and bodies broken in half. (Note: the website referenced suggests only preparing live crab. I just don't have the heart. I buy quick frozen, half-cleaned gumbo crabs, which have been cleaned of carapace (outer top shell), the 'face', and often the gills, removed. And they are dead. If all of this sounds like more trouble than you want to go to, pick up a pint of lump crab meat and add it at the end of cooking. You'll lose some of the slow-cooking crabby goodness, but, yes, you'll save mess and time. And forevermore, don't use krab (artificial crab meat usually made of pollock, or another similar fish). Just skip crab altogether before you go and do something considered absolutely vulgar in proper gumbo circles. 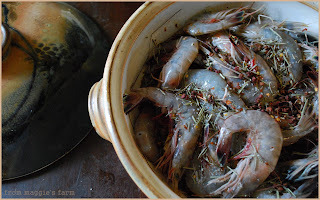 2 quarts seafood stock (I used home-prepared shrimp stock), or chicken, beef, vegetable stocks, or water, or any combination of all, in a pinch. In 3T butter, brown onion, celery and bell pepper over medium heat until limp, and liquid has been reabsorbed. Remove from heat. Prepare roux by whisking flour into 1/4 cup lard (or butter) and 1/4 cup vegetable oil, in a heavy-bottomed dutch oven (preferably cast iron) a little at a time, until all has been assimilated and is smooth. Continue whisking or stirring, constantly, over medium heat, until roux is the color of dark chocolate. Make sure to keep the temperature at medium, to avoid scorching. This can take from 40 minutes to over an hour of stirring. Get yourself a stool, put on some music, and hunker down. If you get impatient and turn up the heat, it will likely burn the roux, and then it's ruined. Throw it out and start over. Never use scorched roux. It's a waste of product and effort. When color is achieved, remove from heat and add cooked vegetables, stirring well. Return to medium low heat, and add stock and whole head of garlic (do not separate into cloves). Increase heat to bring to a low, rolling boil and cook, uncovered, for 45 minutes. 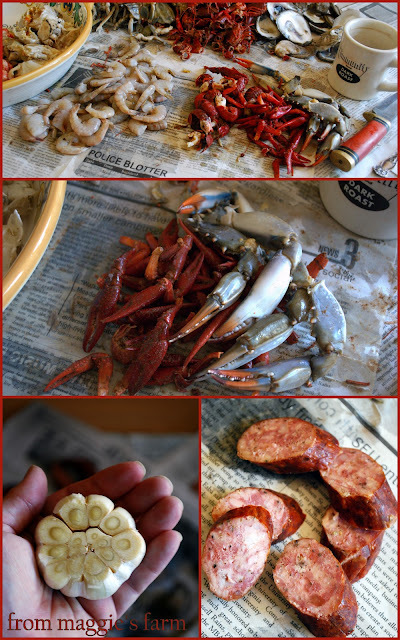 Add crab (along with claws) and andouille, if using, cook for 15 minutes. Add oyster liquid, parsley, and green onions, cook 15 minutes longer. Add shrimp, cooking an additional 15 minutes, or until pink and fully opaque. Add crawfish tails, oysters and remove from heat. Allow to sit, covered, thirty minutes, and stir well just before plating. Serve over rice or potato salad with a few pinches of gumbo file stirred in well, and garnish with parsley and green onions. In some areas of Southern Louisiana, Cajun's often eat gumbo over potato salad, instead, or even in addition to, rice. It's a unique flavor combination, and on occasion, we eat it that way, ourselves. A quick and simple potato salad is best, and we prefer it without the sweet pickle, yellow mustard base of which many southern potato salads consist. For this potato salad, we boiled 2 pounds of small red potatoes in water, to cover, seasoned with 1 tablespoon liquid crab boil, 1 T salt, and one half of a whole lemon. Boil until tender, transfer potatoes to a bowl and mash. Add 1/4 cup mayonnaise, or until your desired consistency, 2T chopped parsley, 2T chopped scallions, black pepper to taste. 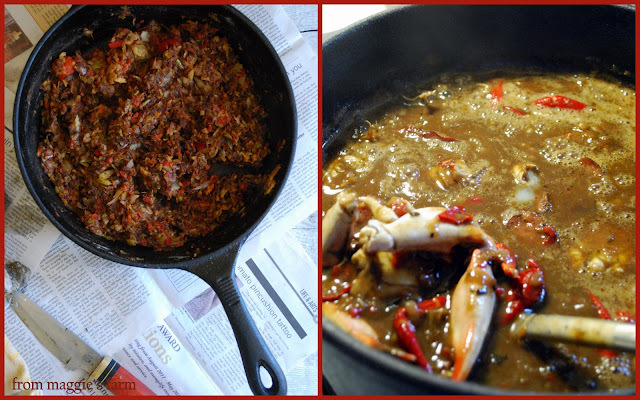 Correct seasonings and serve warm, under gumbo. 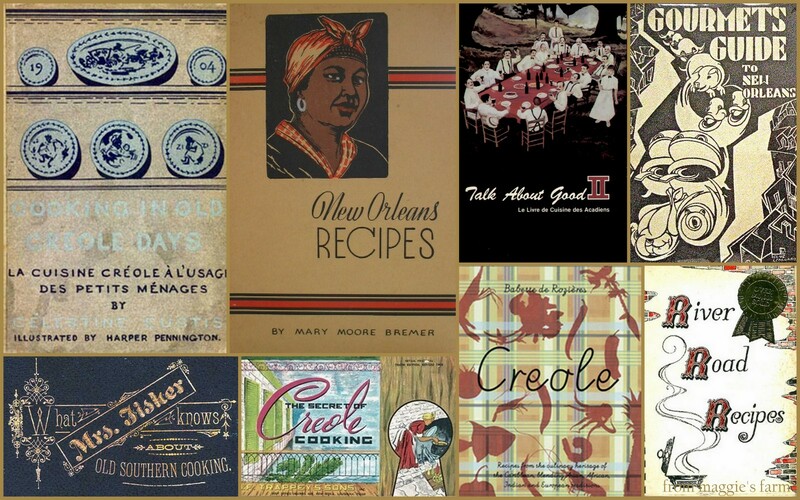 As we discussed earlier in the week, creole and cajun foods differ in ingredients, cooking methods, and presentation. 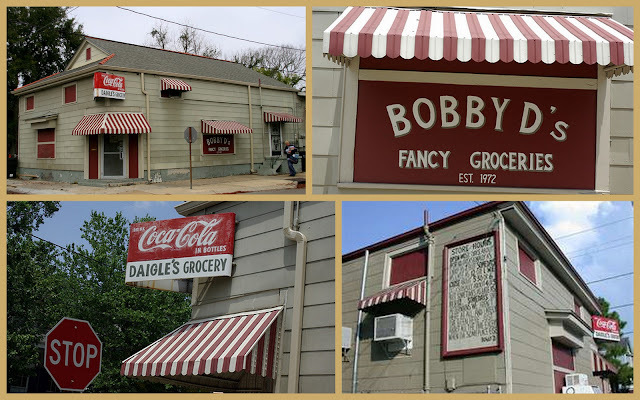 Here, the creole style, served over rice, with toasted garlic bread is popular in the more urban, urbane areas (la-ti-da), while the cajun style, served over potato salad, with crackers, is popular among Cajuns in the more rural settings. These, naturally, are generalizations, and in reality, trying to pin down, exactly, either of the styles is a lesson in futility. They each borrow, peacefully, from the other. I think I ate too much gumbo. 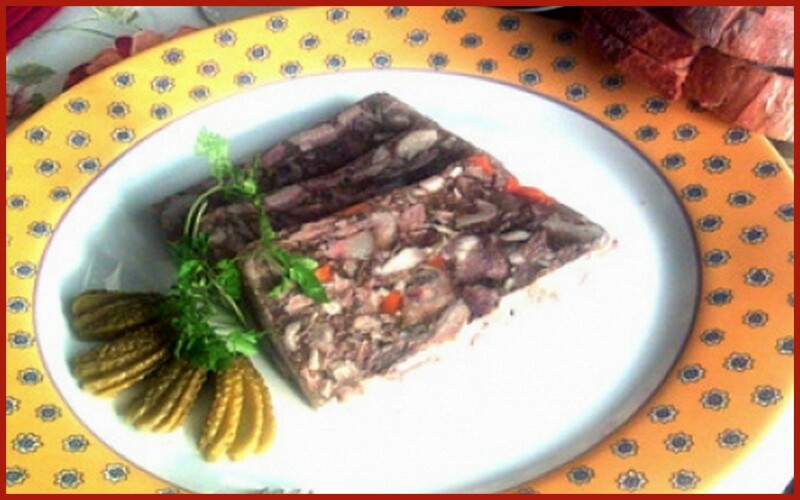 And hog's head cheese. And creole barbecue shrimp. And beef daube glace. And shrimp remoulade. I ate it all. And copious amounts of rich, dark coffee, and maybe a little something more. It was Mardi Gras! And it was goooooood. 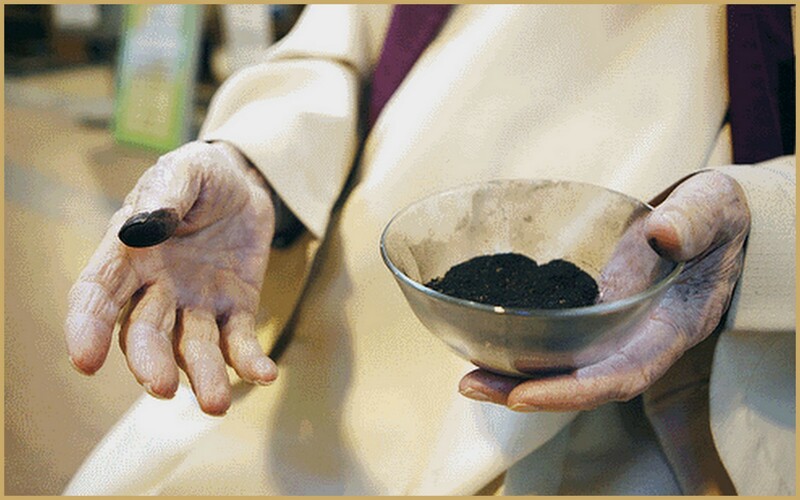 But now, as Lent is to spiritual repentance, so it shall be for digestive penance. We're going to scale back. Way back. Upon a recent visit with the doc, daikon was suggested to aid with digestive issues I was experiencing. Armed with nature's prescription, I took to the books to find ways to incorporate the daikon, a rather mild, crispy member of the radish family, into my diet. Further, I discovered that daikon was popularly used to ease symptoms of many digestive disorders. From popular website, Web M.D., (Daikon) Radish is used for stomach and intestinal disorders, bile duct problems, loss of appetite, pain and swelling (inflammation) of the mouth and throat, tendency towards infections, inflammation or excessive mucus of the respiratory tract, bronchitis, fever, colds, and cough. How does it work? Radish root may stimulate digestive juices and bile flow. Radish root may also be able to fight bacteria and other microorganisms. It was a bit like preaching to the choir, because I already liked daikon, even before realizing it was good for me. And when I read some variations called 'weight-loss tea', well, now, that can't be bad at all. 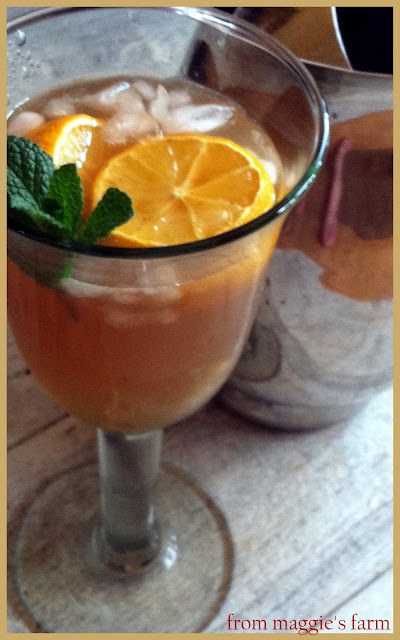 Now, I'm not a doctor, (but I play one on the farm sometimes,) and, naturally, I can't vouch for any weight loss properties of this drink, nor any health benefits of recipes I discovered or created. That said, although I'm not ready for a complete vegan diet, there is no doubt that a move towards a greater plant-based diet is the healthy way to go, so I'm happy to include this vegan refresher in my nutritional medicine cabinet. 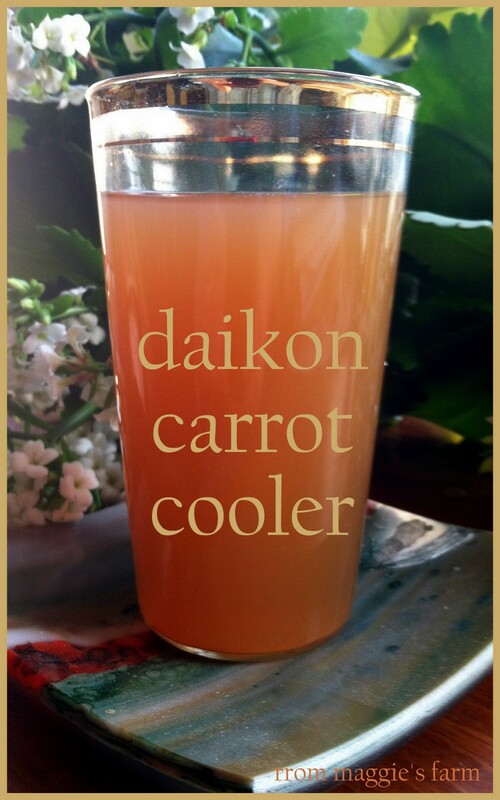 I combined several elements of the recipes I saw, added a few of my own, and came up with a surprisingly refreshing tonic I'll be drinking every morning during lent. Bring first 5 ingredients to a boil over medium high heat, reduce heat, simmer for 20 minutes. Remove from heat and allow to cool. 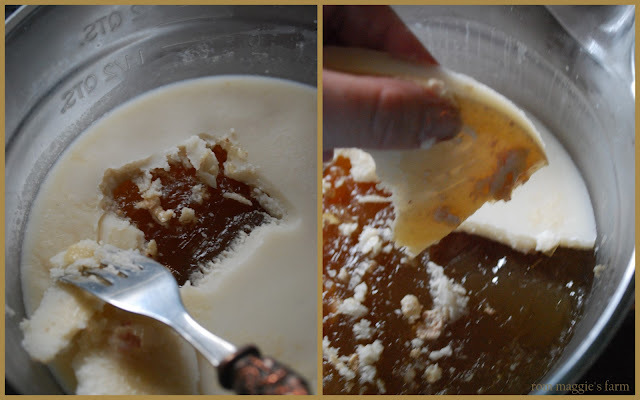 Strain juice through cheesecloth, squeezing solids to extract as much liquid as possible. Serve as is, at room temperature, or chilled, or sweeten with lemon and/or agave nectar, if desired. I tried it both plain, and 'gussied up' and I loved them both. The umeboshi plum vinegar is for flavor, and the toasted nori is added for an additional macrobiotic-inspired shot of minerals. I reserved the pulp and tossed it into a few cups of vegetable stock for soup at lunch. Waste not, want not, as my grandmother would say. 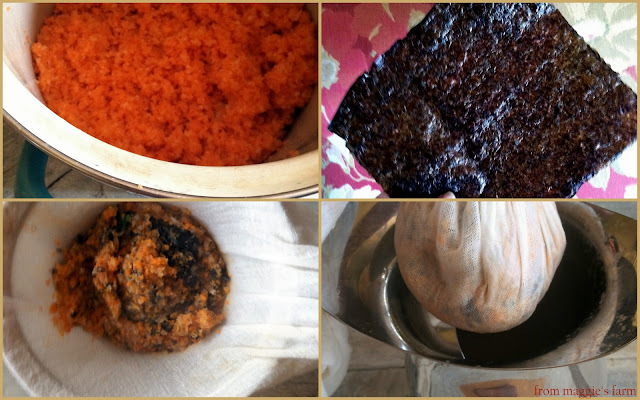 From upper left, clockwise, Grate or process carrot and daikon, add nori and remaining seasonings, strain through cheesecloth, squeeze to get every bit of goodness. There are several varieties of radishes, the most common being oval-shaped and red-skinned. 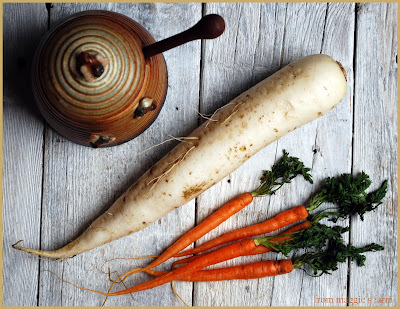 Daikon is an oriental radish that resembles a fat, white carrot. Look for radishes with unblemished and brightly colored skin (in the case of red ones), a firm and compact texture, and short, bright green leaves. Radishes will not keep as well with their tops left on, so remove the tops before storing. They will keep for up to two weeks in the refrigerator. Radishes are most often used in salads or as a garnish. Daikon radish is also often used in sushi rolls, and is delicious braised in a bit of sesame oil. Red radishes are a great source of vitamin C and are rich in minerals like sulphur, iron and iodine. Daikon is even better with vitamin C, potassium, magnesium and folate, as well as sulphur, iron and iodine. Carrots should be bright, firm and smooth skinned. Avoid carrots that feel rubbery or have cracks or small rootlets. Carrots vary in size depending on the variety, and any type can be harvested early as a more tender baby carrot, though some types are bred specifically to have smaller roots. The “baby” carrots typically found in supermarkets are larger carrots (usually varieties bred for consistent color and sweeter taste) that have been machine cut to achieve their tiny size and uniform shape. Carrots will keep for weeks in the refrigerator. Store them in plastic bags, or cut carrots can also be stored immersed in water in a plastic container (some experts recommend changing the water every few days). Do not store them near apples, bananas or melons as the ethylene gas those fruits produce will increase the bitter tasting compounds in the carrots called isocoumarins. Carrots should be thoroughly washed and scrubbed. It is not necessary to peel them, although many cooks prefer to do so because it will change their surface texture and also will remove the outer layer that may contain more pesticide residue than the inside of the carrot. Carrots are loaded with vitamin A. Look for red or purple colored varieties, which are packed with anthocyanins. "...Here am I. If you do away with the yoke of oppression, with the pointing finger and malicious talk, and if you spend yourselves in behalf of the hungry and satisfy the needs of the oppressed, then your light will rise in the darkness, and your night will become like the noonday. The Lord will guide you always; he will satisfy your needs in a sun-scorched land and will strengthen your frame. You will be like a well-watered garden, like a spring whose waters never fail." Mais Cher, we're going to learn how to make seafood gumbo! We (that means you!) are going to learn how to make a gumbo of which you'll be proud this weekend, and a few preparatory pointers will give you the tools you'll need to become a gumbo master. Or gumbo mistress, if you prefer. On this edition of Tips for Tuesday, we've collected some links and videos to get you started. and get's pretty technical, but that's Alton, you know. 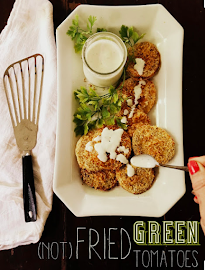 And, from one of my favorite cookbooks for cajun and creole cuisine, a neat interactive site, the hi-tech alternative to the book-in-hand, River Road Recipes Interactive Cookbook. It's not free, it's not imperative, but it might make a nice little treat for yourself, and packed with several books-worth of notable regional recipes. Join us this weekend, when you've recovered from the revelry, and we'll stir together all these tips into a fine pot of what can only properly be referred to as........magic. 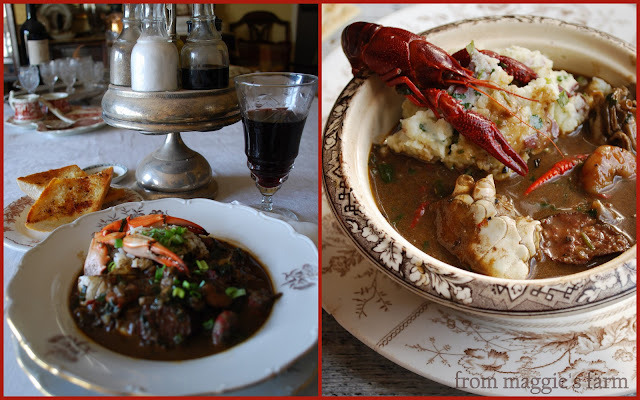 So, while we're one the subject of Lundi Gras, and by natural extension, Louisiana cuisine, what's the deal with Creole vs. Cajun cuisine? Aren't they one in the same? Cajun cuisine is a "table in the wilderness," a creative adaptation of indigenous Louisiana foods. 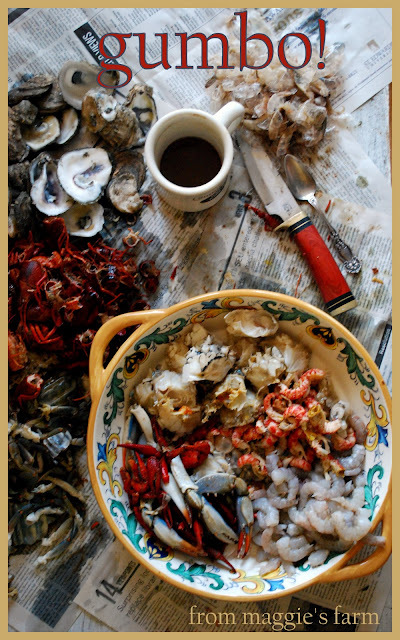 It is a cuisine forged out of a land that opened its arms to a weary traveler, the Acadian. The Creoles were the offspring born in New Orleans of the European aristocrats, wooed by the Spanish to establish New Orleans in the early 1690s.... Today, the term Creole in New Orleans represents the native born children of the intermarriage of the early cultures settling the city.These include the Native American, French, Spanish, English, African, German and Italian and further defines the cuisine that came from this intermarriage. "Cajuns eat in the kitchen. Creoles eat in the dining room." Even among natives of Louisiana, the differences are muddied, and you'll get a feel for the confusion, and fierce loyalties, in this lively discourse. 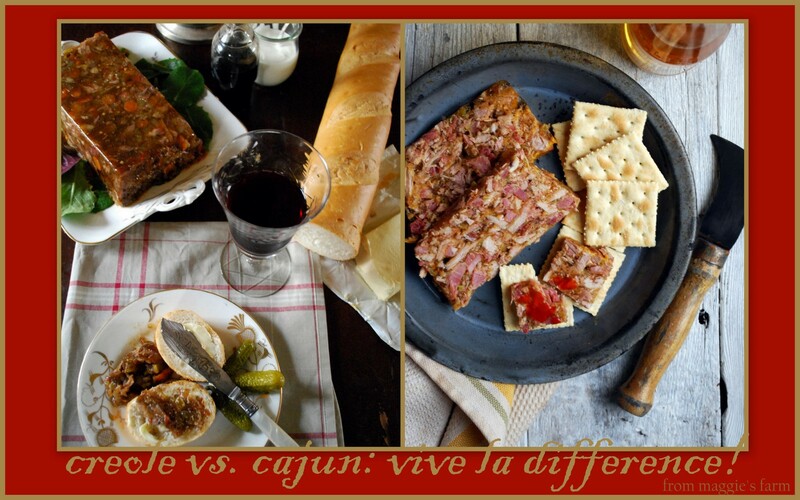 Today, the differences in the two cuisines can be illuminated by comparison of two very similar dishes-- *Creole Beef Daube Glace, and it's Cajun cousin, **Hog's Head Cheese. 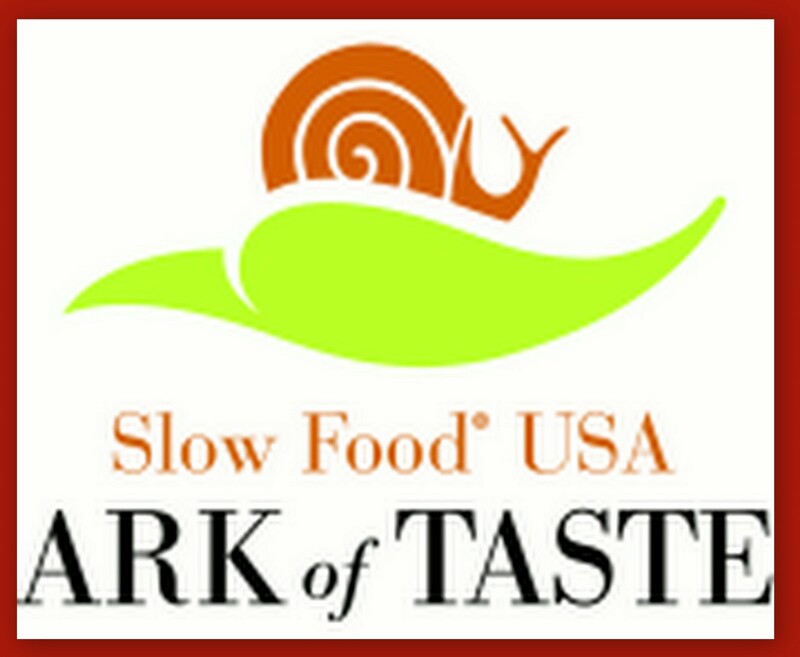 Both are members of Slow Food's USA's Ark of Taste, a list, by region, of 'endangered' foods that are worthy of preservation. For purpose of illustration, imagine two men at lunchtime, today, or 80 years ago, it's much the same. Baptiste is our gentleman friend in New Orleans. He's taking a break from a case he's been working on; he's the attorney on record for an unnamed politician, and his legal wranglings have left him with little time, but quite an appetite. He decides a quick repast is in order, so he puts in a call to the house to have lunch delivered. Something light, he requests. Thirty minutes past, he answers the knock at the door, delighted to find his sweetheart, Evangeline, with a picnic basket. He pulls the napkin from the top to spy the goodies she's packed for him. Service will be on bone china, a pearl-handled knife to spread european-style butter upon his crisp, still warm baguette. 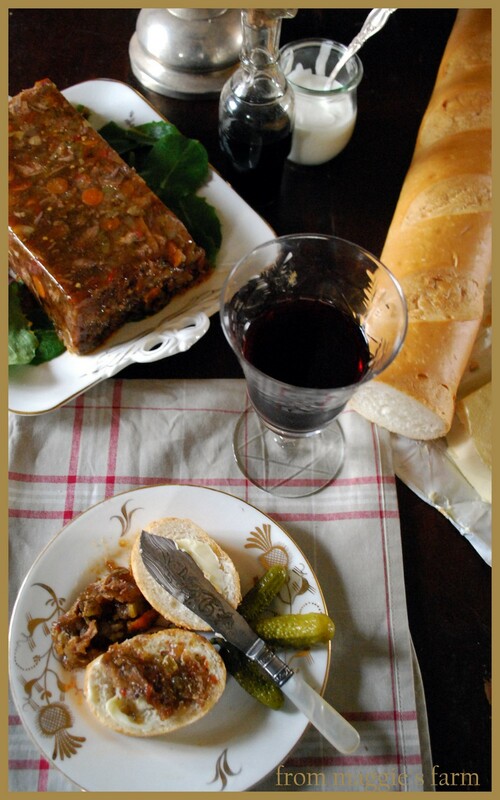 He's having a favorite snack, beef daube glace, served with cornichon. 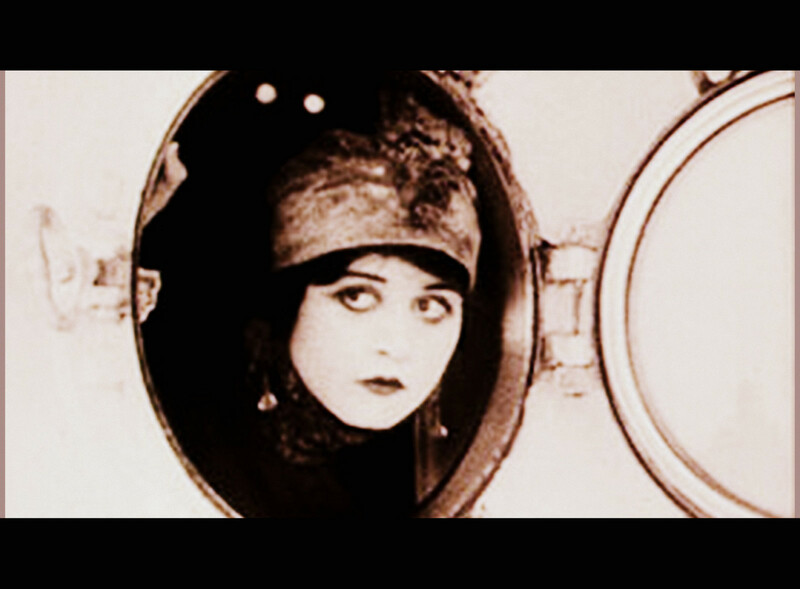 Evangeline has thought of every last detail--she's packed the cruet of vinegar he'll sprinkle on his bread, a small carafe of Bordeaux and his favorite crystal goblet, even the condiments in their sterling carousel. He's delighted to find the creme fraiche she prepared last night, and, naturally, a silver spoon. He knows--this is the life. 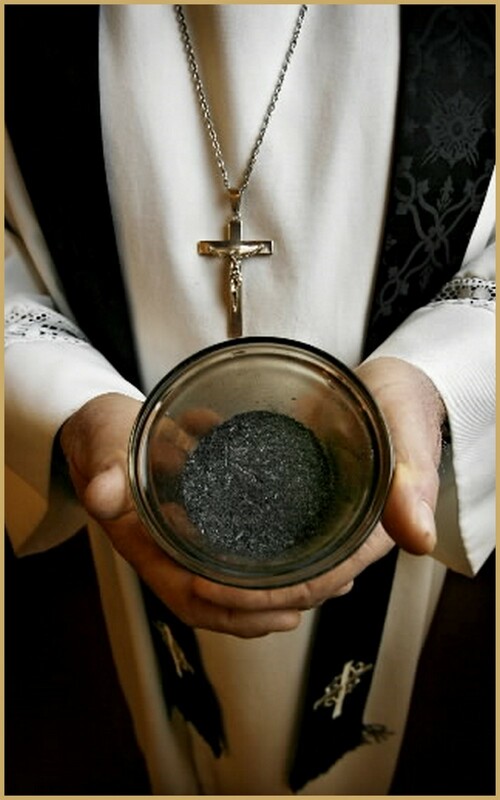 Under the window of his office, on the sidewalk,below, Rene and Jacques brush the mortar and dust from their hands against the bib of their overalls, the closest thing to a clean spot they can find. They've worked since sunrise, and although Rene's wife, Jolene, has packed a lunch for them both, they are eager to complete the stonemason's project for which they've been hired, in order to earn a small bonus for their efficiency. 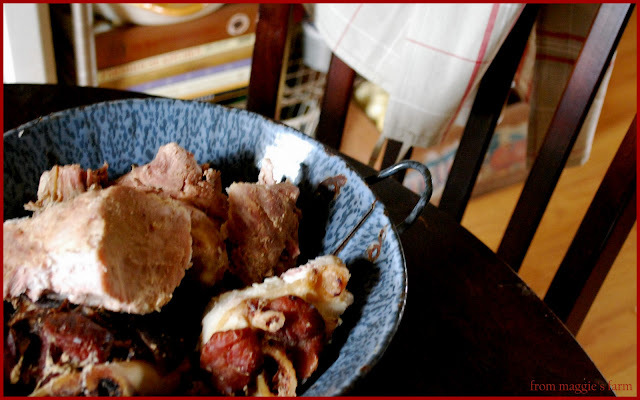 Today, they are eager for the feast sure to be set before them, because they know it's Thursday, the day after Rene's sister makes the head cheese from pork scraps she's saved, and sends over a pan for his family. Rene and Jacques are treated like kings--theirs are always the first slices of the loaf. Jolene has thought of everything--a bottle of hot sauce, a tube of saltines for each, and in a small metal box, she's packed ice around two bottles of beer. No bottle opener, but Jacques makes quick work of using the edge of the cement windowsill and a firm tap with his fist. 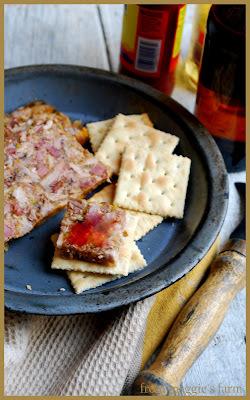 He pulls the hand towel from his belt loop and lays it out on the ground, Rene takes the utility knife from his toolbox, slices the head cheese into cracker-sized pieces, and they both relax for the first time that day. Jacques takes a swig of cold beer, tops a first saltine with a slab of head cheese and hands it to his friend who shares this meal with him every Thursday. Leaning back against the brick wall, they both know--this is the life. Different food, different cultures, different lives, but yet all quite the same, in many ways. Creole or Cajun, in food and in cultures--I think we can come to a consensus that it's all good, Cher! *with modifications, we used the Creole Beef Daube Glace, page 166, found in Cooking Up a Storm, a post-Katrina recipe collection from the Times-Picayune newspaper, and identically here. 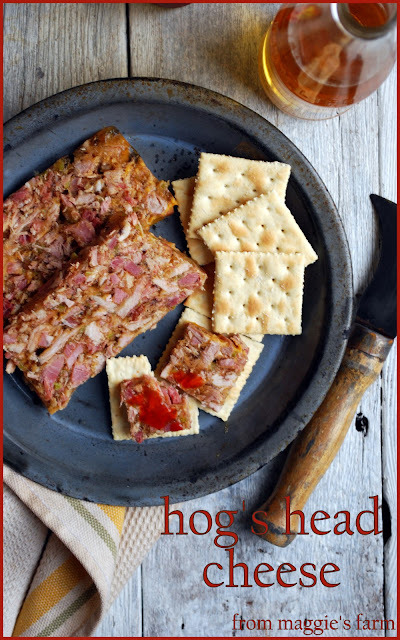 **with modifications, we used the Hog's Head Cheese recipe, page 40, inspired by a visit to Bailey's Andouille and Produce, in LaPlace, Louisiana, found in Feasting on Asphalt, by Alton Brown. 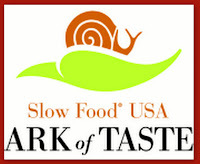 More on those recipes, with modifications, this Saturday, on the weekend edition of notes from maggie's farm, when we're doing our part to save these rare dishes from extinction. Perhaps you'll pitch in on the effort by trying them out yourself. Are Cajun and Creole the Same? Weekends around here are often dedicated to 'real writing', (of course all writing is real writing) that is, writing that involves NO FOOD. 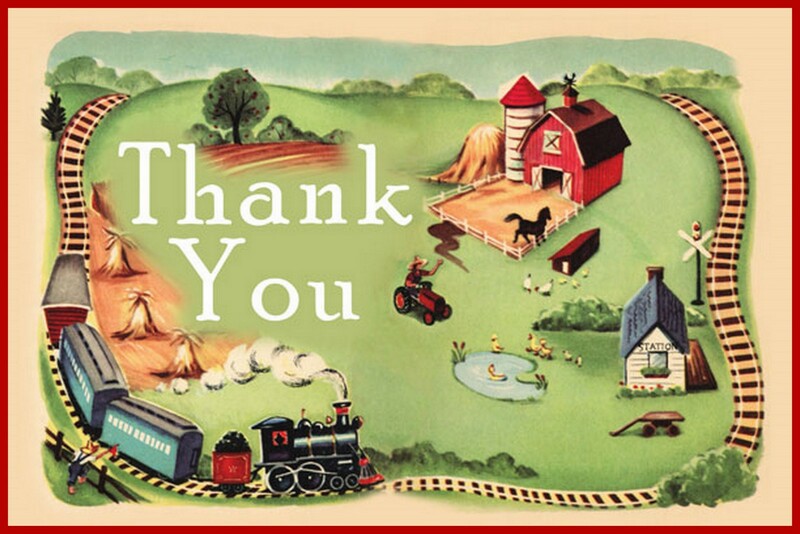 It's upon occasions like this one, and this one, I will write entire 'posts', or opinion pieces, or lifestyle pieces that have little to do with food, but much to do with one farm keeper's life, or life beyond. Concentrating solely on the word, without having to make them dance around a specific food topic is liberating. This blissfully damp morning is such a morning. Poultry, chickens and ducks and turkeys and guineas and the like, get a bad wrap. People often call them dumb, or stupid, and for the life of me, and them, I can't understand why. They fascinate me. I could watch them for hours. I'm so happy to have a spot from which to spy on my flock from inside my warm and dry home on days like these. 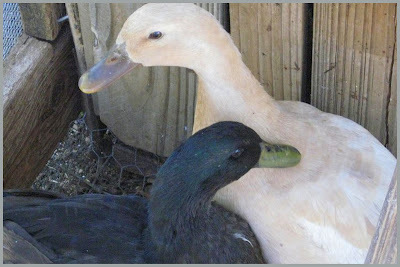 I looked out the kitchen window this morning, waiting for my coffee to cool from it's scalding-like-asphalt-fresh-from-the-pot temp, and watched one of our ducks, Click, partner to Clack, giving herself her sacred morning bath. This is no perfunctory get-ready-for-work shower. Click revels in the bath, especially when her pond has been topped off with fresh water, whether from the tap, or, as is the case this morning, a rainfall, most awesome. Perched firmly at the edge, she ducks her head into the water, and then, emerging, tosses it from her bill, back onto her body. Vigorously. Over and over. I mean, she gets a real kick out of this. She strains her neck around and burrows her bill between feathers, shaking dust loose, unearthing any tiny insects that may have taken up nest since yesterday's bath. She shakes off droplets, and preens about, inviting admiration from her fellow ducks, and grudging curiosity from the chickens with whom she shares the yard. 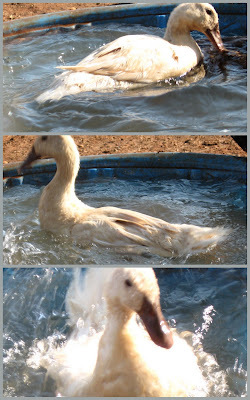 Click is the diva of the duck bath. When she feels she's ready to put her best webbed-foot forward, she's off to the coop. She's taken to laying her morning egg in the hen's nesting boxes. Housing is no longer segregated; she insists upon equal sitting conditions. She takes her own sweet time to deliver what she deems the finest egg among the morning's offerings--it's set apart from the pile of baby blues, khaki's, and peaches, this fine, large, thick-shelled alabaster-toned egg. It really is a beauty. Afterwards, she will dismount, descend the stairway, snag a spot of feed, have a little 'me time'. She's not ready to join the ranks just yet. Most of her day will be spent unearthing grubs and seeds and following, mostly, in line with her fellow ducks, but this moment is all her own, as if recharging after her morning duties. Perhaps a duck devotional, if you will. Like the morning coffee, bath, meditation and writing that prepares, for the day, the human that keeps her, she has her ritual, and is most at peace when able to keep it faithfully. And then she's ready for demands of the day. We are so grateful for you, the kind readers who stop by, give encouragement, keep us motivated. Steph, at The Chickpea Chickadee and Rambling Wren (both great blogs, how impressive to keep up TWO!) is one such reader who often takes time to leave a little note, and in so doing, buoys the spirit of those of us who blog away, never really knowing, except by the inhuman 'stats' we consult, sometimes occasionally, sometimes obsessively, if what we go on about has any real value. So it was with delight that we discovered Steph had graciously nominated us for a Liebster Blog Award. Accolades! We love accolades! 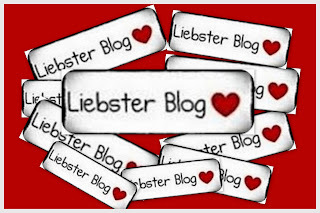 The origins of the Liebster Blog award are somewhat unclear but the general consensus is that it originated in Germany, Liebster meaning favorite or dearest, to showcase bloggers with fewer than 200 followers. Upon accepting the award the recipient must then pass it on to five more blogs of note. The idea of the Liebster Award is to recognize up and coming bloggers who's work is among those that inform, delight, and reward us, regularly. There are many in our blogroll who qualify! To help narrow that field, the Liebster is intended for the newest of blogs, those with less than two hundred followers (yet). The blogs that follow are all well on their way, and some may have arrived at that or more; I'm not certain how many followers each has, but how fun it is to capture them before the huge growth spurts they will all inevitably enjoy. Secondly, to link back to the blogger from whom you were awarded, post your award, by saving the image, below, to your blog, and nominate five of YOUR favorite young blogs, as below. Some are new, some are new to me, I just know you'll enjoy them all. Thank you for sharing your gifts with me, blogger friend. My days are blessed by your words. 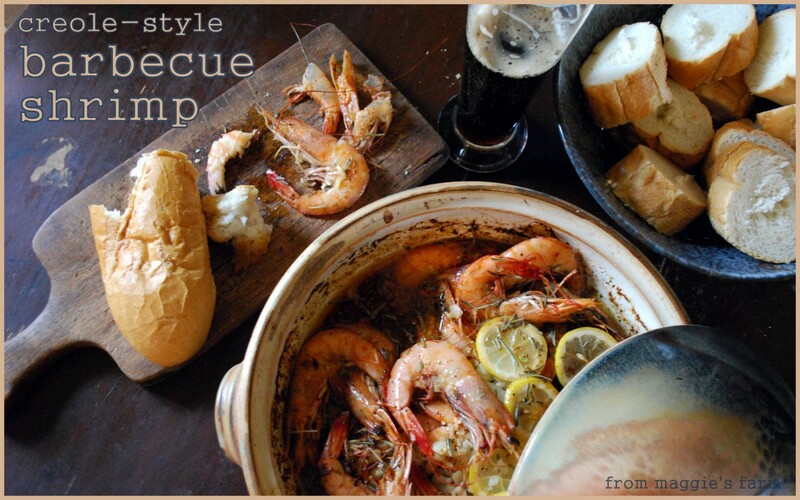 Barbecue shrimp, (or barbecued shrimp, or bbq shrimp, can't ever pin anyone down on this, or anything else of a Cajun nature, for that matter) neither cooked on a 'barbie', nor slathered with sauce of the same name, is a drippy, garlic-y, herbal-ly, buttery, delightful mess of a dish, adored by one and most, and certainly, yours truly. Well, just as the late Justin Wilson, famous cajun cook and humorist, might say, I'ma tole you, its worth dat mess. Dey going give you some oh dem wet nackins to clean you's hans, and you's gonna see dat dees babies is some good, cher. You gots to pick you up sum of deez jumbo shrimps, maybe tree or two pounds, and make dis stuff fo youself, and you will see it taste much mo betta than it looks. See? Not so easy to pin down Cajun matters, as I said. The dish is not easy to find outside of Louisiana, or, for that matter, inside Louisiana, either. Folklore suggests it originated at Pascal's Manale, in Uptown New Orleans, but history, and availability, is spotty. So, after studying my favorite Creole cookbooks, and reminiscing upon the versions I'd been served, I took to the kitchen. After testing about 15 pounds of shrimp's-worth of recipes (oh that was not so hard at all) as I am wont to do, I tweaked this sauce so that it tasted just like I remembered, plus a tad bit 'mo betta'. Worcestershire Powder—I used 2 T of powdered Worcestershire, which lends a concentrated flavor, but doesn’t thin the buttery broth too much, however, if powdered Worcestershire isn’t handy, ¼ cup Worcestershire sauce may be substituted. 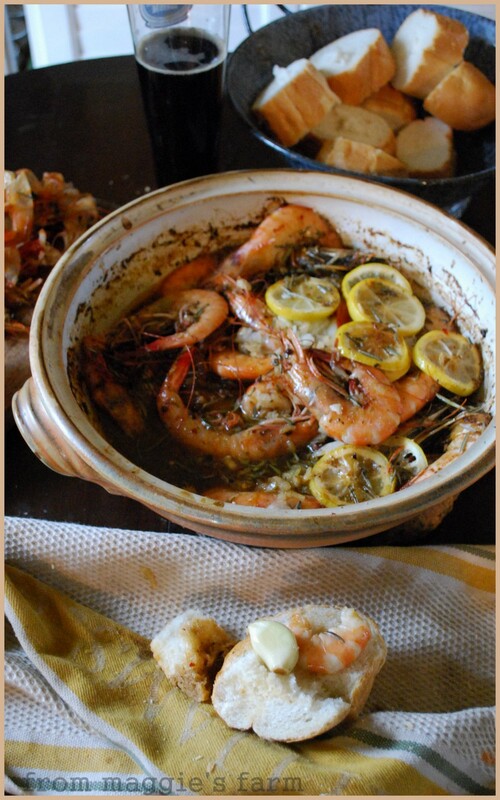 Layer shrimp, sliced lemons, and chopped onion in a baking dish. Toss in the garlic cloves. Combine broth ingredients and cover shrimp. 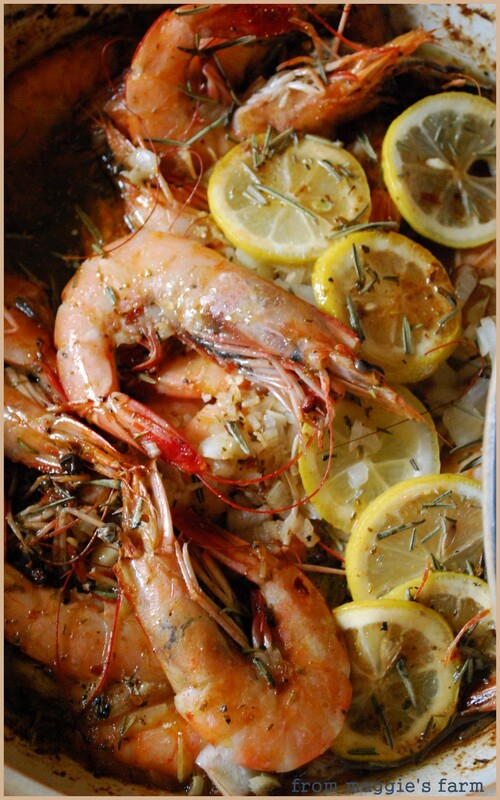 Bake, covered in a 375 degree oven, for 20-25 minutes, turning shrimp halfway, or until shrimp are pink and opaque. 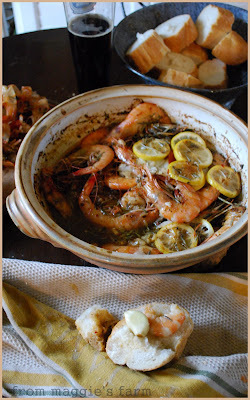 (note: overcooking the shrimp will make them tough and hard to peel.) Uncover, and let set until cool enough to handle. Serve with a some warm damp cloth napkins (a dozen or so'll do you) and a baguette for 'sopping' the broth. This is not optional. This is mandatory. This is gooooood. Photographer gets the leftovers. Yay, me! Pinch the garlic cloves and they will pop out of their skins. 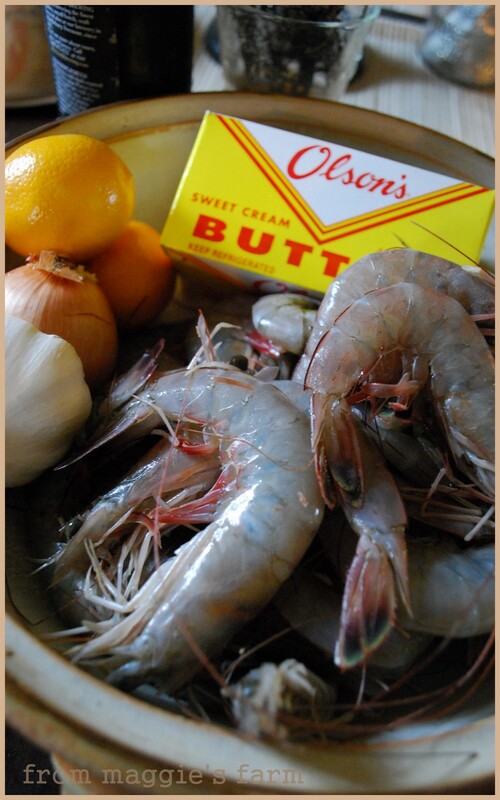 We love to eat them, and the minced onion, on the chunks of 'dunked' bread, along with the shrimp. 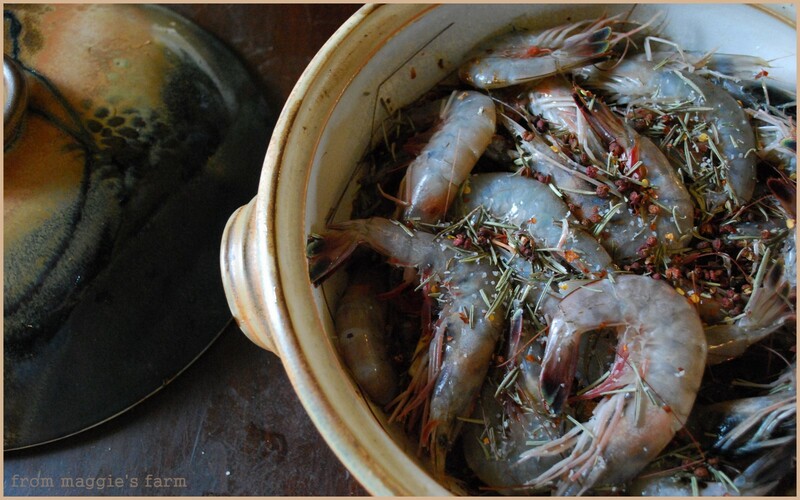 Peel shrimp by grasping the body firmly and twisting the head off. Turn the shrimp over and pull off its legs and peel away its shell, working from the top to the tail, then simply pull on it until comes away. 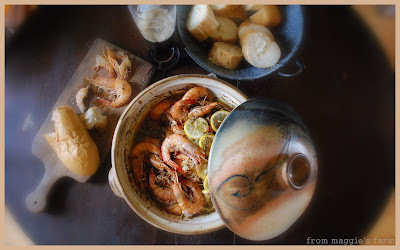 Why keep the shrimp heads (ewe!) on? The fat in the head melts, and lends it's flavor to the broth. Believe me, it's not anywhere near as good if one uses heads-off shrimp. Promise you, when you gently pull the heads away from the body, nothing gooky happens. Y'all, it's sooooo worth the mess.